On this page we will introduce you how Christmas, New Year's Eve and Epiphany are celebrated in Barcelona. We will tell you how the locals celebrate and what you can do in Barcelona during the holidays. We inform you on the business hours of restaurants, shops and museums, on hotels, English-speaking services and much more. Christmas is a special holiday also in Barcelona, even if it is not as important as it is in other parts of Europe. A lot of (secular) presents are exchanged on Christmas and especially on Epiphany, but at least as important as those is the Christian and ecclesiastical background of the feast – in Barcelona combined with Catalan traditions. The Christmas atmosphere which often ends so abruptly after the 26th of December can be enjoyed for longer in Barcelona: here the Christmas lighting is not taken down before Epiphany on January 6th. Epiphany is more important – especially for the kids – than Christmas Day itself. Around Christmas, the streets in Barcelona are brightly illuminated, Christmas trees are lavishly decorated and you can buy presents and festive delicacies. The pre-Christmas season begins on December 8th with the Feast of the Immaculate Conception. It is now that Barcelona is adorned with Christmas decoration. Especially important are nativity scenes, depictions of the Bethlehem stable in which baby Jesus was born. With moss and small utensils, such as tiny stoneware jugs, the depiction is to look as authentic as possible. A typical symbol of Catalonia is the "caganer" (Catalan for "shitter"), a figure depicted in the act of defecation that stands close to the nativity scene. He is no parody of any clerical traditions but a symbol of a healthy body that fertilizes the ground and thereby provides a good harvest. 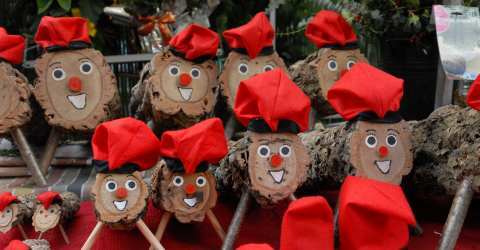 Another Catalan tradition is the "Tió de Nadal" or "Caga tió" ("shitting log" in Catalan), a log with two legs, a red hut and a smiling face. He is gently covered with a blanket and fed every day. On Christmas Eve, the tió "shits" little presents for kids. As opposed to the rest of Europe, Christmas Eve and Christmas Day in Spain are not regarded as an important day for the handing out of presents. After a lush meal with the whole family only little presents are exchanged. Christmas Day is celebrated with the family and another opulent meal, then with a visit to friends or relatives or simply going to a bar or restaurant. The actual and much more important handing out of presents takes place on Epiphany, the day the Three Kings brought their valuable gifts such as gold and herbs to Jesus. Already on January 5th there are processions. The children place their shoes in front of the door, water for the camels of the Three Kings and letters with wishes for Father Christmas. The eagerly awaited handing out of presents takes place after an opulent dinner with Roscón de Reyes, a special Christmas cake, served as dessert. January 6th is the climax and end of the Christmas time –the next day kids go back to school and grown-ups back to work. You might think that all inhabitants of Barcelona gather on the streets and places in order to await the turn of the year. A very important tradition: At 12pm sharp the church bells ring 12 times and with each chime you are supposed to eat a grape – at best on one of Barcelona's many places. This will bring you luck for the new year. Don't look for fireworks. Except for the odd New Year rocket or firecracker there will be no action, so there is no need to climb on a hill to admire the fireworks. Instead, a good dinner before going out is recommended. People like to go to discos, bars and clubs; little pubs are popular as well. The Fira de Santa Llúcia is held since 1786 which makes the Christmas Market in front of the cathedral one of the oldest and deeply rooted traditions in Barcelona. Christmas decoration, little presents such as candles, scarves, incense sticks and sweets can be bought there. The market is famous for its historic purpose: the sale of building material for Christmas mangers. An important building material, moss, could in former times be found on the steps leading to the cathedral. Today you can also buy figurines of saints and animals, plants and wood, miniature stoneware jugs, small bridges and even whole scenes depicting the Nativity in order to decorate your own Christmas manger. Opening hours: end of November/ beginning of December until December 23th, on weekdays 10.30-20.30. 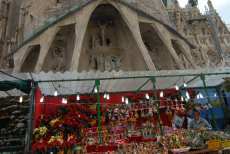 The Christmas Market Fira de Nadal in front of the Sagrada Familia is smaller than the Fira de Santa Llúcia. It also focuses on building materials for nativity scenes but you also find a large selection honey, candles and sweets. The setting in front of the stately Sagrada Familia is extremely impressive. The climate is mostly mild with sunny and not too cold days. There might be a little rain as well. It is unlikely to snow in the time before Christmas and during the holidays. Day temperatures are between 10 and 15° C. In many restaurants and pubs you can even eat or have a drink outside. The evenings get chilly, so it is recommended to bring light winter clothes. There are both an English-speaking protestant and catholic community with English-speaking services. You can find the exact dates on the websites of the church communities. Many Restaurants in Barcelona are open on Christmas, New Year's Eve, New Year and Epiphany. Especially the restaurants of top-end hotels (4 stars and more) are open and offer special Christmas menus and events on New Years' Eve. Please find recommendations sorted by districts including address, phone number and web address on our restaurant webpage. English is spoken in most of the places. Most sights are closed on December 25th and January 1st, but you can still admire them from the outside. You might for example take your time to look at the Sagrada Familia's façade of the birth of Christ: You can stand in front of it for hours and always discover new elements you have not seen before. Or you stroll up the Montjuïc. Many hotels and restaurants offer a special program on New year's Eve for their clients. If you don't fancy a set program, you might also walk up the Ramblas and browse the brochures given out there. You will surely find something to do last minute. Most shops and sights are regularly open on December 24th, some shops however only before midday. On December 25th most museums, other sights and shops are closed. Only little supermarkets that cater to the daily needs are open. On December 26th most museums open again, some of them with slightly different business hours. Please find the details on the sights webpages. On New Year, most sights and shops are closed. When you live in an apartment you should better go shopping beforehand. 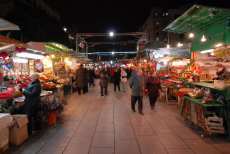 Between Christmas and New Year shops open with regular business hours. January 6th is another holiday but the sights are open. The metro and busses run during the holidays but have a different schedule. On Christmas for example they run until 23.00. Please find details posted in the stations. If needed, you will always find taxis around Christmas.